▲ The members of the Dongguk University Cooperative are announcing the winning student of the prize lottery. 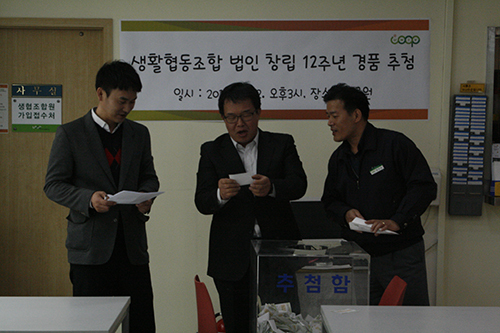 The Dongguk University Cooperative held a prize lottery, celebrating the 12th anniversary of their cooperate body establishment on April 12th, at Sanglokwon. The members of the Dongguk University Cooperative randomly picked out the winning coupons from the urne, rewarding 94 students with prizes, such as 10,000 won worth vouchers for “The Face Shop”, a XiaoMi Power Bank, and a Samsung Gear S2 smartwatch. The grand 1st prize gets a chance to experience a survey of cultural relics. Meanwhile, the Dongguk University Cooperative annually hosts a survey to cultural relics in June. Students are interviewed to be selected as the member of the survey, as they only have room for five students.